New Scorpion Gloves: Good, Better, Best! Three new Scorpion short cuff gloves hit the shelves recently. The Scorpion Cool Hand II are the most rudimentary, followed by more robust Scorpion Klaw II, and topped off with the more aggressive Scorpion SGS. Between the three, you shouldn't have any problem with summer glove selection this season. The Scorpion Cool Hand II Gloves are a basic mesh option with padding in the knuckle and overlays in the palm for comfort. NightViz reflective piping is used for added visibility, while the inner fingers offer flexibility with Lycra inserts. This is a good glove at a good price and we'll leave it at that. Made from a more durable goatskin leather, the Scorpion Klaw II Gloves offer more substantial protection, with their TPU molded knuckle armor. A slight pre-curve helps you grab the controls with ease and Neoprene detailing around the wrist provide additional comfort. Adding Knox SPS palm sliders, Superfabric armor plating and a kangaroo skin palm, the Scorpion SGS Gloves are the top of this short-cuff pile. 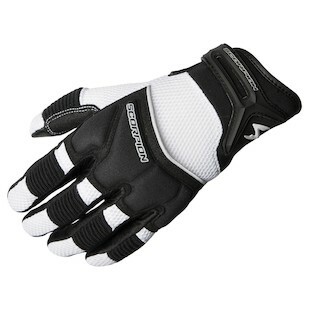 Additional protection comes from a Kevlar reinforced palm and Kevlar reinforced finger seams. Top grade perforated leather make this an excellent balance between summer comfort and substantial protection. In our opinion, this is a good, better, best scenario. 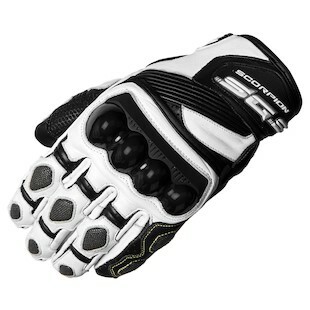 Get the SGS Gloves if your wallet allows, but if not then trade down comfort and protection accordingly. 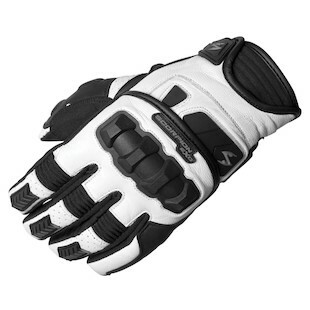 See the full Scorpion Glove line-up at RevZilla.com.